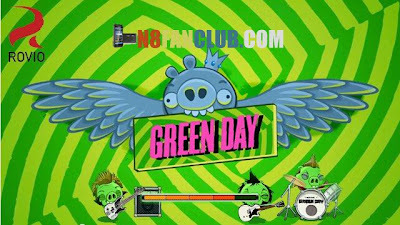 Angry Birds Green Day mobile download is a new episode of famous game with ten new music-themed levels plus bad-pig characters. The mobile download presents new pig enemies, they are designed to look like members of post punk band. Connecting to the name of the game it includes Green Day’s newest single, “Oh Love,” and song “Troublemaker”. The game is rather addictive, so you couldn’t stop playing. A new character in free mobile game is a pink bird who bats her eyes and distracts enemies by blowing egg-shaped bubbles. Play through well-know game genre and have endless fun with popular sequel. Compatible with S^3 / Anna / Belle Smart Phones.